We work with isolated and underserved groups in remotely developed parts of the world. Most often these communities are indigenous to the region, and suffer from a social and economic schism from the mainstream population in the country. They are excluded in the political sphere and neglected in allocation of State resources. As a consequence of their remoteness, these last-mile populations are also deprived of access to normal welfare facilities and economic enablers. They are usually very low on literacy, with girls by far more deprived of education than boys. Food insecurity is chronic and leads to hunger and malnutrition, and healthcare is rarely near-at-hand. They are almost wholly dependent on nature for their consumption and livelihood needs. Remote areas are usually the most biodiverse, but also eco-fragile. Increasing populations are however stretching the resources and putting the ecosystems at risk. Dependent on nature for their consumption and livelihood needs. Remote areas are usually the most biodiverse, but also eco-fragile. At the same time, the communities are among the poorest in the world. These remote areas lack in adequate infrastructure, such as power, roads, and the technologies for processing, which traps them in production of low-end, primary produce. Being at a great distance from the markets, they also face a high exchange rate, with low revenues for local products and high cost of those purchased from outside the area. 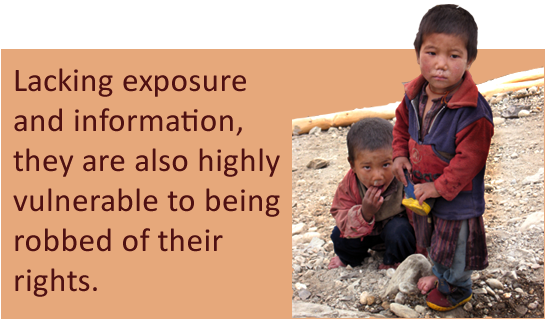 Lacking exposure and information, they are also highly vulnerable to being robbed of their rights and a fair share of benefits. The people have a very strong sense of community and deep cultural roots. The communities and the areas they inhabit have certain inherent strengths, and therein lies the path for development. They have great natural and cultural wealth, which is also unique to the respective areas. The people have a very strong sense of community and deep cultural roots, and a tending to common benefits and sustainable development.